After a peaceful morning in the sleepy town of Bruges, we were ready for a full afternoon and evening (and night) in the Belgian capital of Brussels. Brussels was one of the cities I was most excited to visit and I was a little disappointed that it didn't live up to my expectations. Nevertheless, I did still enjoy the remainder of my time in Belgium. We first stopped at the Atomium, a large stainless steel structure right outside the city, created for the 1958 World Fair. It's a bizarre structure and we didn't quite know what to make of it. What we did like, however, was the stand next door that sold the most delicious waffles I have ever tasted in my entire life. We of course opted for the ones covered in chocolate and they did not disappoint. From the Atomium we went straight to the city centre, where we were let loose in the huge city with only a badly labelled map and the promise to return to the train station at 11pm. We didn't know where to go so we settled for exploring a few of the parks in the area before making our way to the famous city square. Side note: Brussels is built on a hill, which was not reflected on our map. Thus, navigation was much more difficult than we'd expected. We eventually made our way down to the square but not without a few wrong turns. The square was not as I'd expected it to be either; the area was much smaller and the buildings were shorter than I'd anticipated from pictures, and when we reached it I thought we were still in the wrong place. After recovering from our disappointment, we decided to stop at an Irish pub for lunch before further exploration. As we sat eating our food, a torrential downpour began. We tried to wait it out inside, but eventually had to leave the safety of the pub and brace ourselves against the rain. We stumbled upon the Manneken Pis, Brussels' famous peeing statue, quite by accident, which on this particular day was inexplicably dressed as Dracula. We made a little detour to hit the Godiva store where we bought dark chocolate covered strawberries - half the price they sell them at in the States - and snacked on them the remainder of the day. The rain had nearly completely let up by this point and the sun was peeking out again, so we visited Egmont Park briefly before walking the 30 minutes needed to reach the European Union. We weren't able to go inside and we left shortly after arriving as the guards looks especially threatening that day, but we were happy to visit such an important European establishment. We spent the rest of our time in Brussels in and out of cafes and buildings, attempting to ward off the cold and exhaustion that built up over the day, occasionally running into unexpected mishaps. 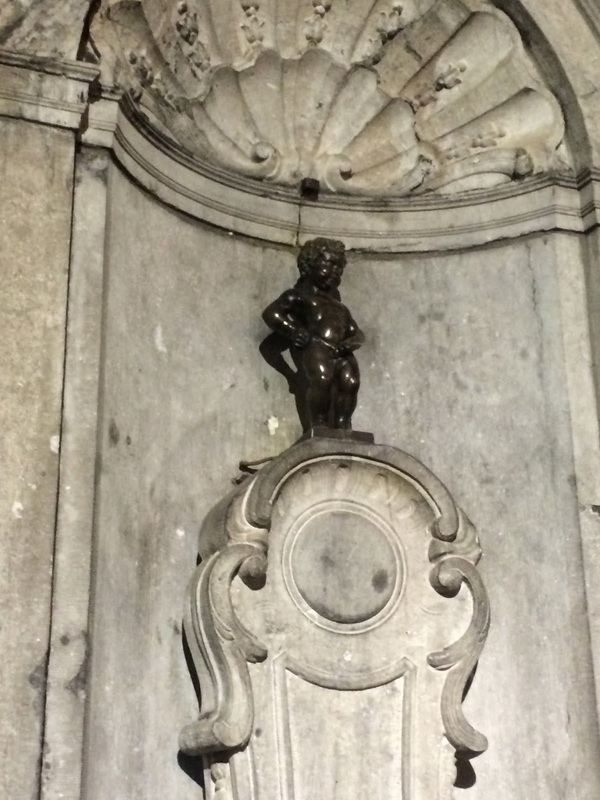 We visited the Manneken Pis again and the second time he was... as the sculptors intended. We were accosted by a group of teenagers who wanted to take our picture "to make memories," which we politely declined. On our way back to the train station, we took the wrong turn up the hill (I'm blaming our badly labelled map) and it took us an extra half hour to figure our mistake and make it to the station. Brussels was a bit of an ups-and-downs city for me. On the one hand, it wasn't as beautiful as I'd imagined and I was hoping for more of a distinct "Belgian" feel instead of a completely cosmopolitan city. But on the other hand, it was full of well-maintained parks and places to buy chocolate and waffles. Brussels isn't a place I would choose to visit again (been there, done that), but I am happy to have visited such a historically important city.